I read recently that the reason for "senior moments" - you know when you can't quite recall someone's name in an instant - is because the aging brain is simply taking in more data and trying to sift through a clutter of information. And, while some research indicates this slowing down is often to the brain's long-term benefit, one wonders what the impact is of too much Internet information that comes through our RSS readers. Or rather, too much uncategorized, random, noisy information that comes from working on the social web. About ten days ago, shortly after I finished presenting at the Share Our Strength Conference my mobile phone started to vibrate wildly because it was getting many incoming text messages. What's going on, I wondered. As it turned out, it was direct messages from scores of Twitter followers thanking me for the follow. Due to some technical glitch, my Twitter account started to automatically follow the 4, 393 people following me. All of a sudden my Twitter stream exploded with a sea of tweets from people who were new to me. The human mind craves order and categories, so while it fun to discover new people through a John Cage like exercise in randomness, I wondered how I might be more efficient at following a large number of people. A couple of weeks ago at the New Marketing Summit, Chris Brogan did a 10 minute demo of his work flow to answer the question, "How do you keep up with all this?" (I captured it on Qik) He mentioned Tweet Deck. Replies: The replies panel not only picks up people who have used the @reply convention at the beginning of the tweet, but anyplace in the tweet. The Twitter web interface doesn't - so if you want to know who is talking about you, you had to do separate search on twitter search. Retweets: It does this automatically - rather than cuting and pasting. Also gives a choice of different URL shorterners. Profile View: You can click on the person's avatar/profile and it shows up in another screen. (See above). This is useful if the number of followers you have surpasses the dunbar number because I don't always remember people by name - and the visual helps. Another reason to make sure your profile is filled out too. When you first set up TweetDeck, it only imports 100 of your friends and then it takes time for the rest to be imported. Here's why. The founder of TweetDeck is on Twitter and he is listening and answering questions. If you want some good introductory instructions, do this. The interface cues were new to me, so if you all of sudden loose your three column view and can't find the icons, make sure Tweetdeck is full screen. The software is still in beta - so it may crash on your or you may encounter some bugs. I've had some performance issues. Also, it meters your use of the Twitter API, so if you go over a limit, you'll have to wait a bit. Now of course, I enjoy discovering new people and new ideas - so I do keep the ten minutes a day of dipping in the full unflitered stream to discover something - but I also now have the option to be focused. TweetDeck was one of the 7 filtering tools mentioned in this post by Mashable. Given my interest in information coping skills, this will come in handy for those who have mastered the basics. 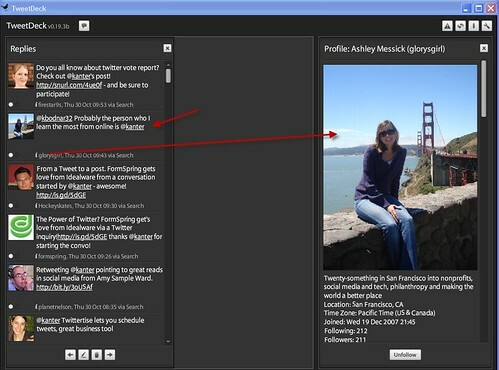 So, if you love Twitter, Tweedeck will help you love it more and more efficiently. Are you using Tweetdeck? How has it saved you time in your Twitter work flow? What other Twitter apps have helped you save time or be more effective using Twitter? A surprise to read your post and see my smiling face. Always happy though to be associated with a social media guru and your blog Beth! I definitely enjoy TweetDeck mainly for the reasons that you pointed out, number one being that it pulls up anyone who @ replies not just those who use it at the beginning of their Tweet. I also find it useful that it gives you a large view of the person's profile pic/avatar. I think it is useful to use a real picture of you as your profile, especially if you hope to meet Twitter friends at conferences or other offline venues. I met up with @cortneym at a cafe when I was in Houston a few weeks ago. I was to meet her at a busy spot but I knew her the moment she walked in because I had seen her picture on her Twitter. We were not at that time friends on any other social media site, such as Facebook, so using her picture on Twitter was key. I just began using Monitter as a Twitter search/moniter. You can type in three key words to the live feed and it will show you all Tweets with that word. The thing I like most, especially for community orgs, is that you can set the location. So for Blood Centers of the Pacific I will not be getting people who talk about donating blood who are in Kansas and not likely to be coming by any of our centers any time soon. Has anyone else been experiencing problems with the "Find People" feature on Twitter? I keep getting a "Feature is temporarily disabled" message. One of the other things I've found helpful about Tweetdeck is the ability to delete Tweets. I've started to do a quick scan, and I remove the posts that I'm not going to act on from the Tweetdeck stream. The others that have links to check out, etc. I'll leave to explore later. Thanks, Beth, your blog totally rocks! 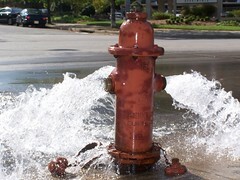 This is great Beth and your words of drinking from the fire hydrant, made me laugh. I've been a user of Tweetdeck since their inception and love it! Thanks! I like the functionality of TweetDeck, especially the ability to set up a Tweet stream based on a search term, but TweetDeck bogs down still. I was running Twhirl and TweetDeck simultaneously for a while, but decided the resource crunch with Twhirl outweighed the benefits. @Laura = My practice has been to "dip into the stream" for ten minutes and let serendipity connect me to someone new or a new idea. I don't think anyone can really follow every single tweet of every single follower - even if you have a lot fewer to follow. Hi Beth - very well done. You highlighted the features you found valuable and included the screen shot to show what you were talking about. Ashley, the Twitter people search seems to be temporarily down--haven't been able to access this in the past few days either. Beth, thanks for the great post. I'm a recent user of TweetDeck & like it a lot. What really sealed it for me was when I tweeted out a question about grouping followers and the developer sent me a tweet back w/ an answer. That kind of response and help itself made me a fan. Thanks Beth - I've been using Tweetdeck for about 2 weeks and enjoy the user interface much more than Twitter. I've not used the group function yet, perhaps because the one flaw for me is the desktop size needed for Tweetdeck. However I still like it, it makes it much easier to review posts by scrolling up and down as opposed to a few tweets each page on Twitter. And, don't forget - you can change the time span on Tweets received with that clever slider at the bottom.